A few months ago, John purchased the BT TV package because it had all the sports channels he'd been missing over the years. "Plus, a few channels you'll probably like too," he added hastily. I wasn't convinced. So unconvinced that I had a slight hissy fit when the box arrived, claiming that he hadn't really consulted me before buying the package and, "doesn't my opinion count anymore? Your penchant for new technology is getting out of control!" This is only because I came home from yoga one Sunday afternoon to find him quietly assembling an Apple TV box in our living room (which has proved to be quite useful, btw) while pretending nothing was out of the ordinary. But then. I turned on the TV. And ... okay, let me break it down like this: EVERY trashy American channel that I had ever missed i.e. TLC, E!, Food Network, Comedy Central, etc. suddenly appeared. All access. I was hooked. I went an entire weekend without speaking to anyone, sitting on our couch-that-is-not-a-couch-because-our-couch-still-lives-in-our-hallway-because-it-doesn't-fit-through-the-living-room-door binging on fascinating American television shows that I'd only heard about and never watched: Toddlers & Tiaras, Here Comes Honey Boo Boo, NY Ink ... you name it, I binge-watched it. Afterward, I felt sick. Really sick. I had to seek relief by switching over to more tasteful programming on the BBC. It was like Alka-Seltzer to my mind and soul. Like every other person who currently watches TV regularly in the UK, I've been hooked on The Great British Bakeoff (or #GBBO, as it's known on Twitter), where Mary Berry (queen of cakes - I have, like, two of her cookbooks - and someone who reminds you of the grandma you wished you had) and Paul Hollywood (king of bread and alleged extra-marital affairs, according to certain websites) put a set of amateur bakers to the test with challenge-themed weeks (pastry, for example) and other impossible tasks. Each baker sets out to out-do each other while giving to-the-camera testimonials about how sad they are someone has been kicked off only to quickly add, "but I'm just so glad I'm here for another week", so really, they're not sad at all. It's all very British: a tent set up somewhere in the middle of the British countryside, historical anecdotes accompanied by classical music so that cakes can be placed in their correct historical context, and passive-aggressive eye-daggers being thrown between contestants as they furiously whip and knead and decorate. The finished products are tasteful and elegant, such as Howard's (one of my favorites, who was unfortunately booted off a few weeks ago) beautiful green tea biscuit pagoda, and something you could imagine being served at afternoon tea in a Cath Kidston decorated living room. It's all super middle-class and comforting. 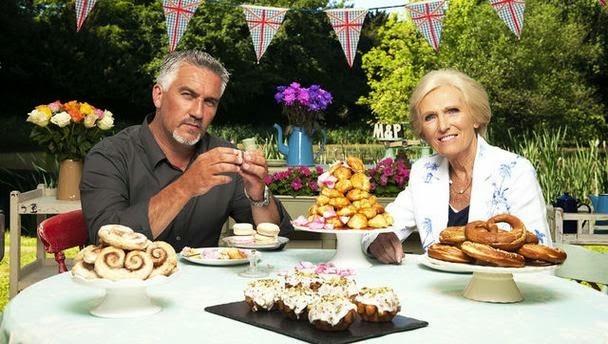 It's all quite different to, say, Cupcake Wars on TLC, which I happened to switch on to during my Weekend Of The Binge. On this show, Kristen Cavallari (who made a name for herself on the reality show, Laguna Beach - if you're not familiar with the show, don't worry, the title says it all) is a featured judge and a ginormous digital clock counts down the minutes and seconds in ominous, red numbers. Having been out of touch with American TV for over six years now, I felt like an alien that just landed on earth while watching this program. If the creations on GBBO were all about understated elegance or quaint, English-related themes i.e. a cake made to look like an "allotment plot" or the Tardis from Doctor Who, then the cupcakes on Cupcake Wars were totally and utterly American: lots of frosting, bright colors, and crazy flavor combinations (i.e. my kinds of cakes). There are no passive-aggressive eye daggers in sight: instead, contestants rag on each others' abilities and in some cases, there are even instances of in-fighting within teams. Fascinating. For me, GBBO is enjoyable but at times a little too prim and proper, while Cupcake Wars is a little like cake on steroids - too much, and I just can't cope. It's funny, because in the US, my friends are all about Downton Abbey, whereas my UK friends are obsessed with Breaking Bad. I love having the both of both worlds and watching pure junk - whatever the accent.